Phosphorus (P) has been shown to limit a number of fundamental processes in a wide range of ecosystems; however, despite its importance, most earth system models do not currently include any manner of the P cycle. This hinders the utility of these models for generating and testing hypotheses and for forecasting the effects of global change. Importantly, a critical challenge for P modeling efforts is also a critical challenge for the scientific community as a whole; namely, determining a way forward for improving our understanding of the key drivers, processes, and global change responses of the P cycle. 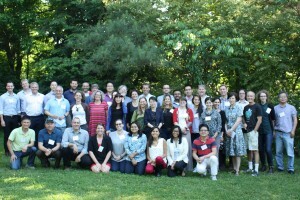 Bringing together P experts would allow for the addressing of this need through: (1) a more synthetic understanding and conceptualization of P cycle dynamics, (2) the merging of varied P and associated data, (3) improved process-based modeling of the P cycle, and (4) P data-model integration. Another potential success stems from the power of explicit collaborations between empiricists who study P cycling and modelers considering the inclusion of P into models. This entry was posted in News on June 10, 2016 by Rosa Casanovas. Summary: This workshop will provide a brief introduction to Bayesian and hierarchical Bayesian modeling. It includes presentation and discussion of basic concepts, including important elements of Bayesian statistics and hierarchical Bayesian modeling. Participants will have the opportunity to develop and implement a Bayesian model in OpenBUGS (in R). This entry was posted in News on June 1, 2016 by Rosa Casanovas.